It’s that time of the year again! A chance for all of our members to get out on the water on boxing day to burn off those winter calories. Starting at 10:30am, crews will be mixed with different genders and ages, and the rowing will commence. 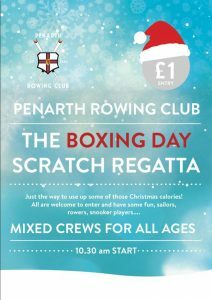 For those of you that aren’t members, be sure to pop down to the Penarth seafront, enjoy the views, and watch some good old boxing day rowing!